The top result at the RM Auctions London 2014 sale was $8 million for a 1956 Ferrari 250 GT Berlinetta Competizione ‘Tour de France’ by Scaglietti. Seven cars sold for over a million dollar each. RM Auctions’ 2014 London Sale was held in conjunction with the Hampton Court Concours of Elegance on September 8, 2014. On offer was 80 cars including no fewer than 23 Ferraris – many far less spectacular or as expensive as the 1956 Ferrari 250 GT Berlinetta Competizione ‘Tour de France’ by Scaglietti that achieved $8.1 million – the ninth highest price paid for a car at public auction in 2014. Seven cars sold for over a million dollar each, including four Ferraris, a Mercedes Benz 300 SL, a Lamborghini Miura, and a Shelby Cobra. The RM Auctions 2014 London sale earned £22 million ($36 million) from 80 collectors cars on offer with a sell-through rate of 86%. * Prices include 12% auction premium. The auction was held in British Pound – US $ conversion as quoted by RM Auctions on the day after the sale. A 1956 Ferrari 250 GT Berlinetta Competizione ‘Tour de France’ by Scaglietti achieved £4,872,000 ($8,119,188) at the RM Auctions 2014 London sale. This was the second highest price paid for a car at a UK auction in 2014 and the ninth highest result achieved world wide in 2014. Owner-driver Jacques Peron raced this Ferrari 250 GT to top-ten finishes in races of the 1956 and 1957 Tour de France series. The car on sale was the eighth of only nine ever produced. A 1966 Ferrari 275 GTB Alloy by Scaglietti sold for £1,960,000 ($3,266,340) at the RM Auctions 2014 London sale. It is one of only 60 alloy bodied 275 GTBs ever built. Originally, the car was finished in blue over beige but in a fully restored condition, it now has the currently more favored Ferrari red paintwork – only two of the top-ten most-expensive cars sold at auction in 2014 were not red; all are Ferraris. 1964 Shelby 289 Competition Cobra – Photo: Robin Adams 2014 © RM Auctions Inc. The third highest result at the 2014 London sale of RM Auctions was £1,176,000 ($1,959,804) for a 1964 Shelby 289 Competition Cobra – one of only three cars to have exceeded the million-pound mark at the auction. The Shelby Cobra was campaigned by Tom Payne in 1964 and 1965, as one of only 32 full “Team Specification” cars prepared by Shelby for factory-sponsored drivers. 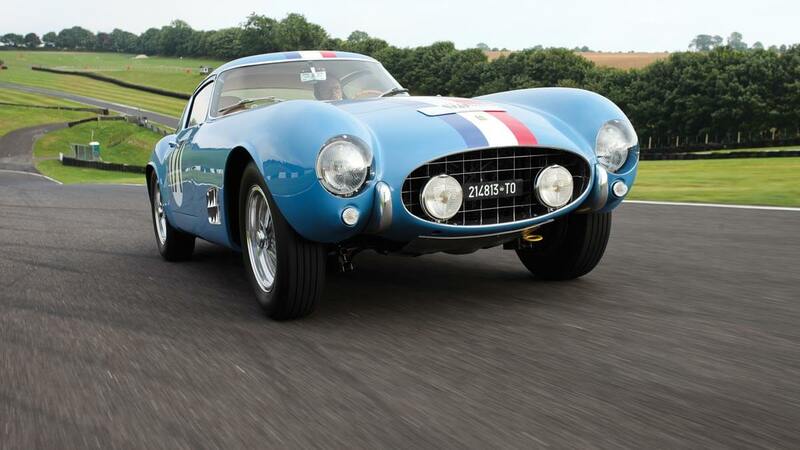 The car spent nearly 25 years in the Shelby American Collection before being sold into private hands in recent years. A 2003 Ferrari Enzo was the newest car by far to have breached the million-dollar mark at the RM Auctions London 2014 sale. It achieved £952,000 ($1,586,508) – right on pre-sale estimate. Only 400 Enzos were ever produced and the original cars were sold only by invitation to previous Ferrari clients. This particular model was sold first hand with only 1,900 km since new. While the top Ferraris sold according to estimate at the 2014 London sale of RM Auctions, the 1989 Ferrari F40 achieved £761,600 ($1,269,206) – near £ 200,000 over the top estimate. At least five Ferrari F40s have sold for over a million dollars in 2014. This particular “Non-Cat, Non-Adjust” model was sold from single-family ownership with 16,000 km on the clock. An ex-Nigel Mansell 1989 Ferrari F40 will be on offer at the Bonhams Zoute Sale in Belgium in October 2014. The 1968 Lamborghini Miura P400 by Bertone that achieved £649,600 ($1,082,556) was similarly the fifth Miura to have sold for over a million dollar this year. The Lamborghini is finished in the desirable Miura green over black and was originally owned by the Kuwaiti Royal Family. The car has covered only 28,000 km since new. A red 1958 Mercedes-Benz 300 SL Roadster narrowly exceeded the million-dollar mark when sold for £616,000 ($1,026,564) at the RM Auctions 2014 London sale. At least 30 Mercedes Benz 300 SL cars have sold for over a million dollars each in 2014 alone but several have failed to clear too high estimates during the Monterey week. This particular car sold for £ 50,000 below the lower estimate. The London sale was RM Auctions last major classic car auction of the year where million dollar prices can be expected. The Hershey (October) and Sam Pack Collection (November) will still have beautiful and more affordable automobiles on offer.